Our BS8599-1:2019 Compliant Personal Issue Kit is a supplementary kit in addition to the workplace first aid regulations. Providing the latest BS8599-1:2019 Compliant Personal Issue Kit for your first aiders is now seen as best practice. 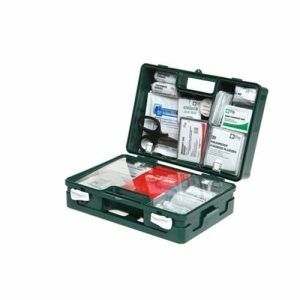 These kits gives a first aider access to a range of essential first aid items. For more information on BS8599-1:2019, please click here. We advise to provide one kit to each first aider plus additional persons where your assessment of needs deems necessary. These kits provide cover for one person, making them lightweight and easy to carry. Choose from either a belt pouch or bum bag to contain your kit. 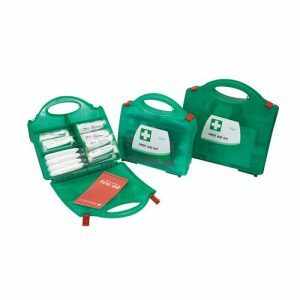 The kit is also available in a small green plastic box making the kit easily visible because it may not always be convenient to carry the kit on your person. 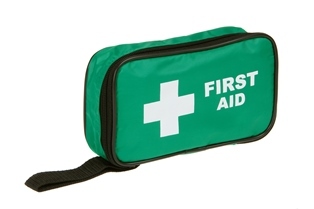 BSI published the new guidelines for workplace first aid kits BS8599-1:2019 in January 2019. 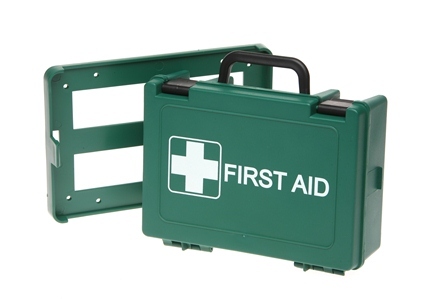 Manufacturers have a year to update their kits to this new regulation however we have done it straight away so you can buy BS8599-1:2019 compliant first aid kits now! If you require further information or would like to speak to us please contact us here and we’ll be happy to help. Fully compliant with the latest BS8599-1:2019 regulations, this kit is supplied in a tough, durable polypropylene box with internal compartments for ease of access. Fully compliant with the latest BS8599-1:2019 regulations, this kit is supplied in a tough, ABS plastic box with internal compartments for ease of access.